The sour cherries are ripe in Central Minnesota. We have the best crop ever and will continue to pick for a few days. Traditionally, cherries have been used as an effective treatment for gout so they have medicinal properties as well as the delightful flavor we enjoy in a variety of recipes. Most people appreciate cherries for the flavors they impart to pies, jams and for us here at Leatherwood Vinegary, wine and vinegar. 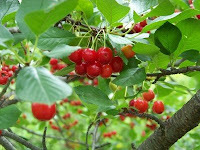 My son-in-law, Jim, was here for a few days last week and when I mentioned something about the cherries being nearly ripe he said that our friend Laszlo, of Hungarian Goulash recipe fame (visit Examiner.com's Minneapolis Herbal Kitchen Examiner-June 8), makes a seasonal treat called simply Sour Cherry Soup. Jim was busy doing professorly things on his laptop in the gazebo when I went to see just how soon the cherries needed to be picked. I selected a lovely ruby trio and dropped them off in the gazebo on my way to pick raspberries. Sometime later, after the raspberries were harvested, I went back in the house and checked my e-mail. There was a message from Jim. The subject title was, “Wow.” The message said, “They were great.” He’d added a link to a sour cherry soup recipe. I e-mailed him back, though by leaning to the left I could see him outside my office window, and proposed that we would have Sour Cherry Soup before dusk fell on the land. Jim was an accomplice to the plot and picked the pound of cherries the recipe required. I made it early in the evening and it was still a little warm when Dawn and Hilary arrived for the weekend. We ate it anyway and put the leftovers in the refrigerator and ate it again, properly chilled, the next day. Sour Cherry Soup is a refreshing cold soup served as a first course or a dessert. It doesn’t have any herbs in it but I suppose you could try sweetening it with stevia instead of the sugar. We talked about artificial cherry flavoring in the July 7 entry. Be assured Sour Cherry Soup has plenty of natural flavor, and a beautiful pink color. Your difficulty might be in finding sour cherries. Don’t use sweet cherries; you’ll want the tang of the sour ones. Wash and pit a pound of sour cherries. This is about four cups. To pit the cherries, use a knife and cut the pit out, use the dull end of a skewer to push the pit through the stem end, or use a cherry pitter. 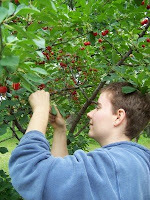 No matter how you do it you’ll lose some of the cherry juice as it’s inclined to drip down to your elbows as you work. We’ve found that placing an old bath towel on your lap is a good way to catch the drips. Cherry juice stains so it’s a good idea to wear an old shirt when you pit the cherries. Put the cherries in a four-quart saucepan along with six cups of water and ¾ of a cup of sugar. 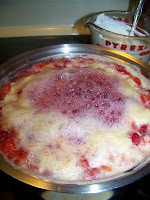 Bring to a boil and simmer for about ten minutes or until the cherries are cooked through. Stir 2 tablespoons of flour, 1 teaspoon of powdered sugar and ¼ teaspoon of salt into 1 cup of sour cream. Add some of the cooked juice to this and whisk together. Then add it to the cherries in the saucepan. Simmer for five minutes. Cool by immersing the pan half way in a container of water and ice cubes. Then transfer to a bowl and chill in the refrigerator. Serve as a first course or add a dollop of fresh whipped cream and serve as a dessert. Two days later we picked about 50 pounds of cherries. There are many more still on the trees since they don’t all reach the perfect stage of ripeness at the same time. Hilary took enough back with her to make a couple of cherry pies. We’ll freeze some for similar uses but most will go into the wine and vinegar process.